Igvars - informative, good conversation, attuned to our priorities, all ferry crossings were met on time, very safe driver (rain squalls were frequent), had a plan B for unexpected road closure, took us to superb views and very interesting eateries, undertook a special delivery of item left in car. New car was very comfortable for an all day itinerary. Addressed all our email queries before booking. Service better than exceptional, deserves 5+ stars. It was a pleasure meeting Igvars. TOUR GUIDE RESPONSE: My dear Friends, big pleasure to meet You! What a great tour! Igvars is a wonderful guide! He delivers a great balance of the major tourist sites and off the beaten path places to explore. You can tell from the minute you meet him that you're in for a fun filled day. His love of Norway, nature, and giving these tours is evident immediately. We were a group of 5 adults of various ages and everyone agreed that this tour was the highlight of visiting Norway. I can't recommend this tour and Igvars enough! I wish there were more than 5 stars to give! TOUR GUIDE RESPONSE: My favorite New Yorkers!!! Igvars was a fantastic guide! His knowledge of region made it a very entertaining trip. He knows all the ins and outs of this beautiful region. He is a very nice and kind person; He was a pleasure to be with. 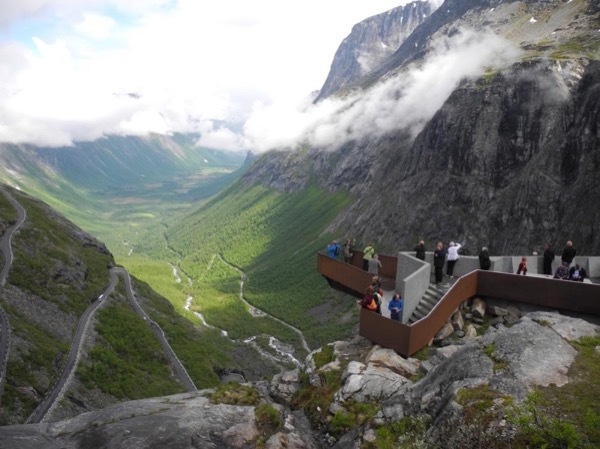 The tour includes visits to the "big attractions" (e.g., Geirangerfjord, Trollstigen). It also covers some other very beautiful fjords and villages in the region. Igvars was fantastic on every level, we had so much fun with him and he had lots of interesting facts and stories to make the day really interesting. His driving was safe and cautious and we felt totally relaxed in his care. We seen so much in one day and lots more than the bigger buses from the ship. We would highly recommend Igvars for anyone looking for a great day out and about around Alsesund. Wow, what a fun day! Our group had such a fun time. I would highly recommend Igvars any time! Igvars was incredible he even managed to engage my two teenagers! We had a wonderful time and would highly recommend him!! This was one of the most spectacular and outstanding tours I have ever taken. The guide was wonderful, the scenery unbelievable...can not recommend highly enough. TOUR GUIDE RESPONSE: Many thanks for great day together! Iggy made us feel special and despite the poor weather on the mountain in Trollsteigen he provided us with a great tour. He always asked our input as he had to improvise because of the weather, he also provided a great lunch including all we could eat local strawberries! Thank you Iggy for the great tour and your personal touch and interest in us having a great day! TOUR GUIDE RESPONSE: My pleasure to be part of Your day and life. Best for Your bee road over flowers. We had a great time on our three days with Igvars. He provided information, good picnics and our time was most enjoyable. Igvars was fantastic. Very knowledgeable upbeat and interesting. A great combination of walking and driving. Thoroughly enjoyable tour. Highly recommend. Knowledgeable, friendly, flexible, new car, excellent driver. The best! 15 of us had a wonderful time with Mr. Igvars and his associates. We were stopping for 8 hours at Geiranger from a cruise ship. The process and communication with him were super easy. He is easy going, accommodating, fun, and professional. We went places that other big bus tours were not able to go. We had delicious local food prepared by Igvars and his associates. It was a very memorable experience for all of us. Beautiful weather helped too. Thank you, Igy!!! From the moment you meet Igvars, you know you are in for something special. Within the first few moments, you realize that everything that was planned for this tour will be done........and then there are the stops along the way to make sure that all of your needs are met. This was a wonderful tour. We saw more than anyone we met on the ship saw.........and the order in which he presented Alesund kept building on the knowledge of the last place..... Seeing this wonderful city with Igvars was wonderful. Highly recommend Igvars! We were a big group and he did a great job accommodating us. TOUR GUIDE RESPONSE: My dear Friends, so happy to meet. You always welcome! TOUR GUIDE RESPONSE: Thank You, Mister M.! Igvars was very knowledgeable and we enjoyed our day with him. He information on living in Norway told us stuff that we would never have known if we tried to do a DIY tour. He is highly recommended..
Igvars is one of the most interesting private tour guides we've ever had. He made our visit to Norway extra special showing this things we never would have seen without his help. I have wonderful photographs and very fond memories of a day well spent. Thank you Igvars for making our stay so enjoyable and memorable. TOUR GUIDE RESPONSE: It was nice day with friends, thank You Ann! Our tour with Igvars was a highlight of our travels in Norway. Our cruise schedule changed but he made the necessary time change and arrived on-time. We felt that we had made a new friend who shared all the highlights that ship tours cover but added so much more! When the crowds were on the big busses we were enjoying a picnic in the sun by a beautiful waterfall. I would recommend him to anyone who wants to experience more than a cookie-cutter tour. TOUR GUIDE RESPONSE: Happy to host! Two tremendous days. Well prepared with comfortable vehicle and a great amount of information. Fabulous! We have previously visited Sognefjord and Naerøyfjord (which we had organised on our own). We are so glad we decided on this tour. The tour with Igvars to Geiranger fjord, lunch overlooking Geiranger, 1500 m viewpoint and other viewpoints surpassed the earlier fjords. Igvars is very personable. He shared interesting pieces of information and also gave us time to savour the scenery. He organised the ferry trips, snacks, light lunch and toilet breaks very well. Highly recommended! Igvars was an informative, friendly, attentive, and energetic guide. Thanks to his knowledge of the area, we were able to see some amazing sights and he shared information about the local culture and history. He was the perfect host. We strongly recommend him. TOUR GUIDE RESPONSE: Happy to meet You in my town, Thank You! Would I recommend Igvars for a private tour? Yes I would, 100% and more. Igvars went over and beyond to provide us with the knowledge and the history of Geiranger. He made us feel very comfortable as though we have had known him forever. He is very comical and funny and so am I. We hit it off from the start. Don't be surprise when you see him because he is 6'7" slim and kind of cute. Four women from GA, AL and FL never dreamed we would be in the middle of Norway having a picnic. Thanks Igvars! TOUR GUIDE RESPONSE: You are my best Oscar 2018 candidates ...and great people :))) You are in my heart! Igvars gave us an excellent tour at our own pace, as my mom is in an wheel chair. He even provided two cars as he thought the van would not be comfortable for our group. Igvars went well above and beyond and we would highly recommend taking a tour with him. Definitely one of the best tours taken, Igvars is extremely intelligent, funny and flexible. He had made his way out for us to enjoy the tours and have gone the extra miles to conduct last minute changes in order to suite our needs, if you are traveling to Norway, Igvars without question is the first choice to consider without any regrets. The guide was very friendly and we enjoyed a lot covering all the beautiful places. Iggy was friendly, knowledgeable, prepared and all around a great time. 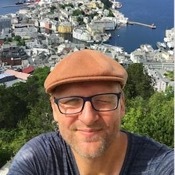 He gave my family of 4 the best tour of all of Alesund. He even customized it to make it unique and fit in sights I requested. He went above and beyond and exceeded all expectations. Thanks so much! Definitely would recommend him 100x over. Igvars is very friendly & accommodating. He picked us up at the bus drop & waited even though I gave him the incorrect arrival time. He was flexible when we asked to rearrange the order of some of the stops on the tour. The stop at the grocery store & grilling dinner were a lot of fun. Igvors is extremely professional n knowledgeable in the visited area.He is also humorous n helpful. He got high rating from our group. TOUR GUIDE RESPONSE: Dear Oi Yuk, it was big pleasure to smile with You . Igvars met us promptly at our ship! He is very tall and thin and easy to spot. He had a very comfortable car for the three of us and we saw SO much while in Alesund. This tour was a highlight of our trip. We enjoyed the tunnels, vistas and various stops. The coffee shop was excellent and his picnic was more than expected. He catered to my gluten free needs and we enjoyed grilled meatballs, vegetables and a wonderful view. He had us back in town with a bit of time to explore before leaving. Igvars was an amazing guide! He took us to places that tourists dont know about! We have seen the beauty of norway on those 3 days with igvars! He was a really kind, funny person and the best thing that he never rush us! We enjoyed every moment without rush! We booked few activities in geiranger that made us late untill 11 and he was really ok with it! The 3 days tour was incridble! Thank you igvars! A nice man, but tour not up to TBL standards. Mainly drove around in his car which had broken passenger window and no air conditioning. Best guide we've ever had!...Igvars went out of his way to personalize our tour...Exceptional experience! We had the wonderful trip to to Geiranger fjords and Trollstigen with Igvar as our guide. He made sure we had many stops to enjoy nature to the fullest (making the experience even better) and also made the lunch picnic an exhilarating experience, eating in the lap of nature. We hope to come back to Alesund sometime :). We had a beautiful tour with igvaurs...best guide and a very good human being.. loved it...will recommend it..
TOUR GUIDE RESPONSE: It was so much pleasure to make Your trip and see Your friendship through years became just stronger. I will meet You in India one day, for sure. Thank You for a day, which was even not working day for me, it was the day with friends.